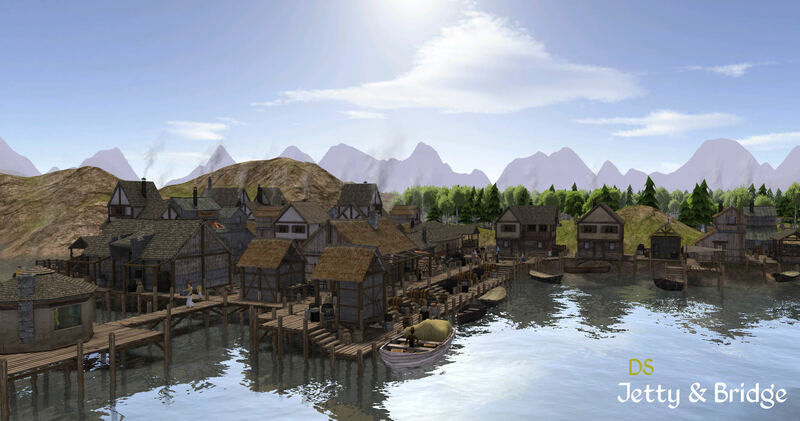 Contains files that alter the vanilla Banished: Citizen, Storage Barn, Yard and Cart, Market, Trading Post and Town Hall, adding new resource limit flags. Also alters the following Dialog (UI) files: CreateBar, ToolTip, ToolTipToolBar, ToolTipUpgrade. 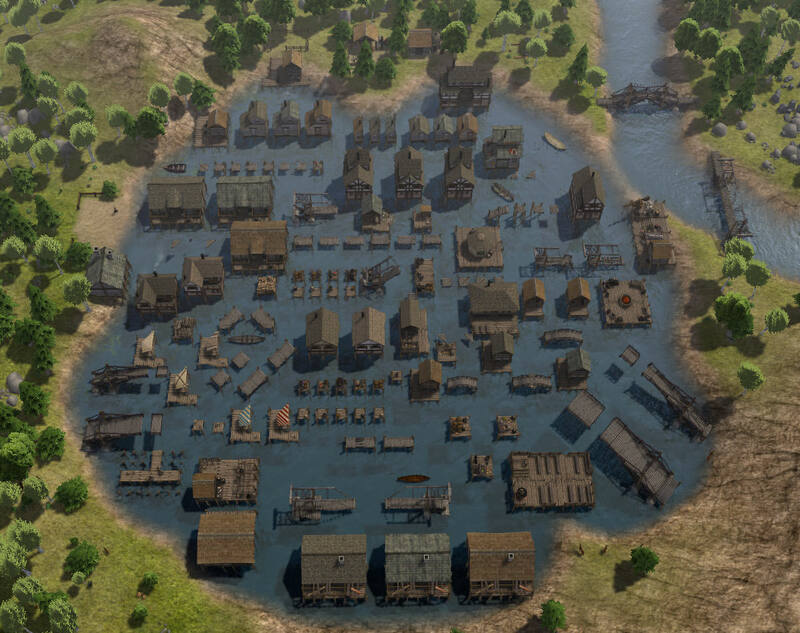 - Vanilla buildings and citizens to utilize and accept the new storage/limit flags. - Alters toolbar & upgrade tooltips to display extra construction materials. - Alters all toolbar hover-over toolbar tips to show a full size icon instead of a 16x16px icon. this was done to display alternate toolbar icons correctly (i.e: 16x32px, 22x32) without having them distorted. 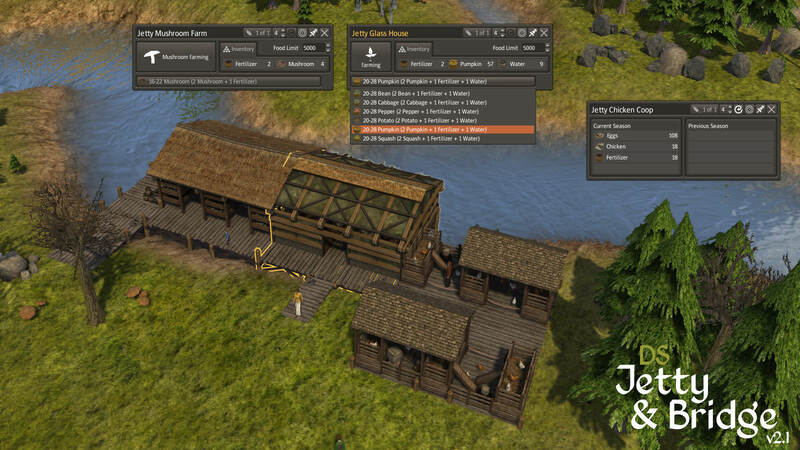 New in v2 is the introduction of advanced building materials: Lumber, Iron Fittings, Glass (& Sand), Wagon Parts and Fishing Gear. 4 land, or land/water based buildings supply a large proportion of these resources. With these added resources comes an increase in construction costs for all jetty pieces. 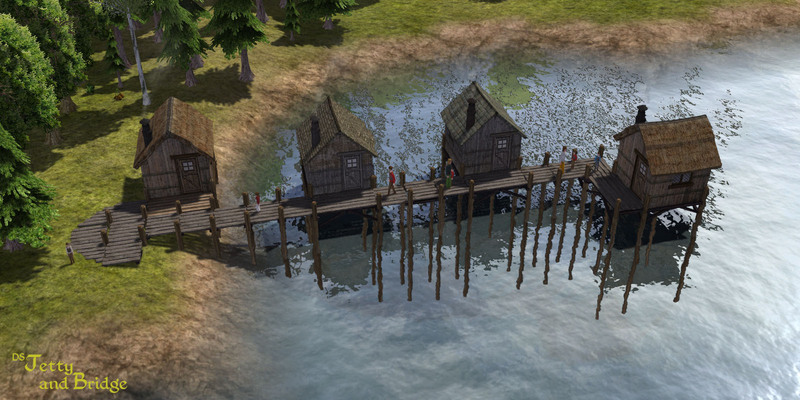 Though difficult, it is possible to start a Hard game and only build jetty buildings (to a certain extent). You will need to micro-manage the town for the first few months/years. Start by clear felling an area to collect some Logs, Stone & Iron (if playing with a mod that adds Iron Ore, it is possible, though this makes a harder game again). 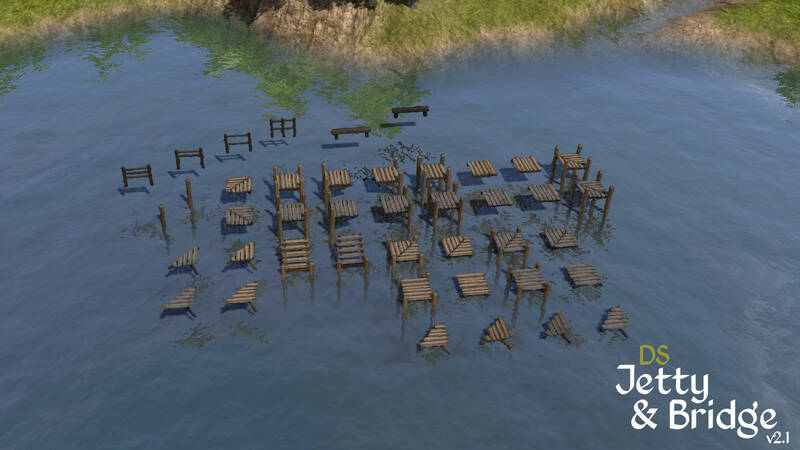 After making a stockpile, you must build the Jetty Construction: Lumber Yard, also at the same time start building the Jetty Construction: Forge. Once the Lumber Yard is built change the production to firewood, it is slower than a firewood splitter, but for now it is all you have. you might want to build a vanilla Hunter or Gatherers Hut to collect some food. With enough firewood produced to make a few Iron Fittings, change the Lumber Yard to produce Lumber. 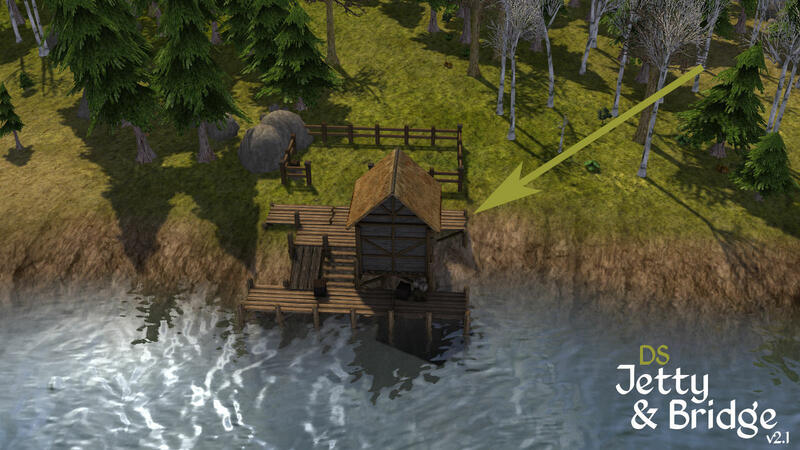 With Logs + Lumber + Iron Fittings you can build a jetty house, don't build anymore than 1 at this stage, and build the first close to or on the shore so the front door is accessible. Get building a Jetty Firewood Splitter to produce more firewood. Keep up the Logs as you'll be supplying it for firewood, lumber and construction use. needed for constructing Markets, Merchants & Drawbridges. The workshop will also produce Iron Tools & Iron Fittings. 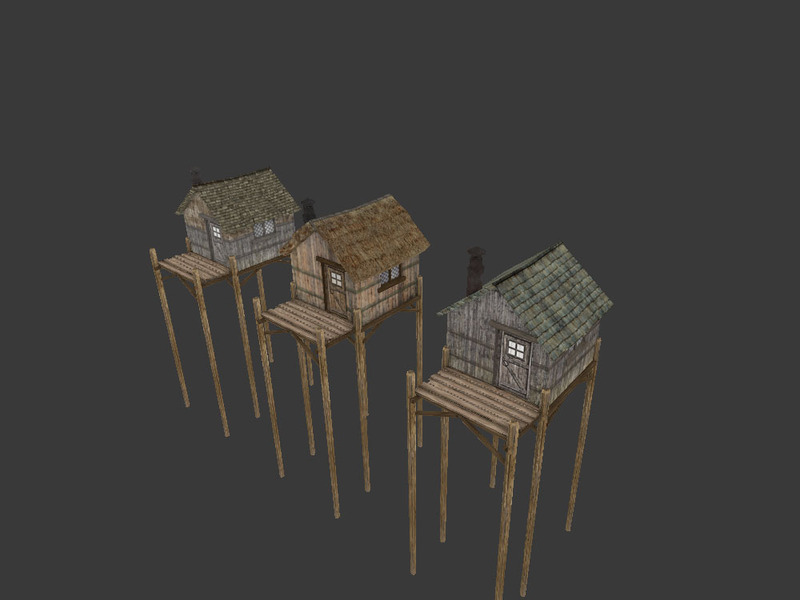 Though not necessary in early game, Glass is needed for some more comfortable housing, the Jetty Construction: Sand Mine is built on a shoreline and will extract sand. The sand is used in the Jetty Construction: Glass-maker, a building also requiring a shoreline placement. Once you can build, staff and supply these production buildings, you can start constructing other buildings and walkways to join them up. - Jetty Walkway pieces: many variants including different levels (and stairs), lengths and angles and some with built in storage. - Jetty Bridges: Arches, modular Drawbridges and wooden truss bridges, angled truss bridge variants. - Village Bridge, normal Bridge construction variants for the Drawbridge and the Truss bridge. - Jetty Storage pieces: 1x1 & 2x2 crates/boxes/barrels, 2x2 log storage, 2x2 firewood storage, small storage sheds, large barns. - Jetty Housing: 2,3,4, 5 & 6 Occupant Homes. 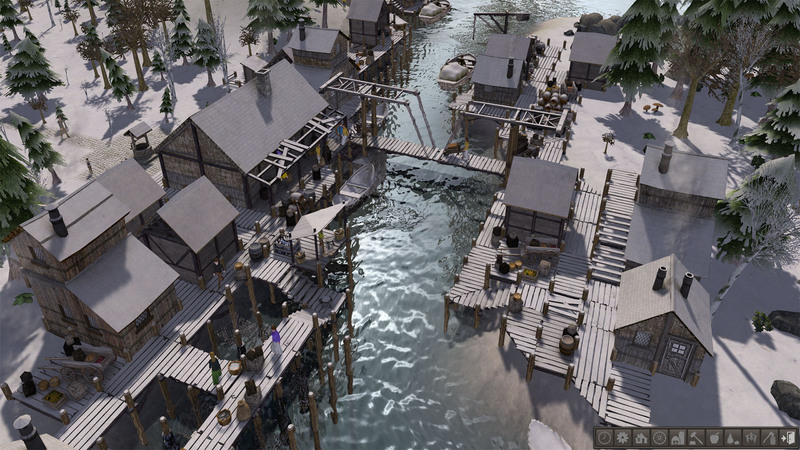 - Jetty Fishing spots, expanded, more variants and options. - Jetty Mollusc Farm, 1-2 Fisherman farm and harvest molluscs. - Jetty Mushroom Farm, grow mushrooms on the jetty. - Jetty Glass House, grow vegetables (beans, cabbage, pepper, potato, pumpkin, squash) on the jetty. - Jetty Chicken Coop, produces chicken meat, eggs & fertilizer. - Jetty Water Store, collect water, edible, used in kitchen. - Jetty Kitchen Kiosk, cook a variety of edible meals. - Jetty Drift Wood Collector, 2 min Workers required, will generate logs and firewood for 5 years. - Jetty Drift Wood Searcher -- similar to the collector, 2 min Workers required, will either generate logs or firewood (you select). - Jetty Tailor, produces clothing. - Jetty Workshop, produces Iron Tools, Fishing Gear, Iron Fittings, Wagon Parts. - Jetty Well for fire-fighting. - Jetty Merchant's Office, a building to display town hall info in a narrow vertical format. - Jetty Deco 1x1, Deco Corner, Deco Stairs Down, Low Jetty Deco 1x1, Low Jetty Deco corner. - Small Boat (added v1), variants in style (covered/not covered) and 3 rotation variants. - Small Rowboat (added v1), 3 rotation variants. - Small Boat (added v2), small boat with external oars, 3 rotation variants. - Small Canoe (added v2), 3 rotation variants. Thanks to everyone who ever offered suggestions and ideas, tests and critiques. and special thanks to kid1293, RedKetchup, kralyerg, Tom Sawyer, elemental, Bartender, Necora, embx61, Paeng who have offered invaluable information, code and banished 'know-how'. 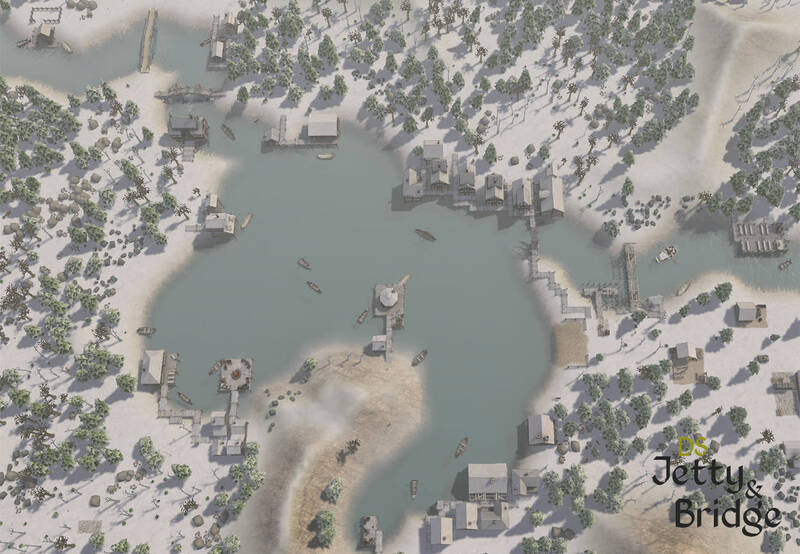 Download DS Jetty and Bridge v2.1 here. Quick request: can the fishing spots (the bridges) please allow for up to 2 people at a spot. I know many people that will fish with a friend, it's a community & social activity as well as a food excursion. That looks fantastic, I've been wanting to play with these new jetties and bridges for a long time, can't wait to fire them up! a very nice one too woohoo ! @ Discrepancy, thank you, can only sympathize, change all the mods to the new belt is huge dedication, a lot of it will take time and effort. New update available from Downloads. As you can see I made changes to Resource file names, so I daresay it might not be save-game compatible (I didn't have a save to test with). Because the update is small, and may not make much difference to the game, I leave it to player choice on whether or not to update at this time. I'm working on a major update for this mod which includes a full changing of all the code that has 'DSSV' to 'DSJaB', started tonight and just spent 3hrs on it. All I achieved was the renaming of the files and code as well as making the AO images for just the ground level 1x1 f-key jetty variants and cnr pieces! as a break from the tedious work, I'm going to model something new. Besides, the next few weeks I'm likely to have more time to code than to model. 2x3 it includes the jetty piece in front of the building. I've got these set as 1-2 occupants, so new families won't have children. There will be bigger houses also. Looking good. Do they need to have the built-in jetty piece in front though? (Or, could you make a version that doesn't have the jetty piece?) In your pic, with the houses forming part of the jetty "road" if you delete house 2 or 3 you break the road. If the houses just sat next to a normal (separate) piece of jetty this wouldn't be a problem. Okay @elemental , I can do that easy enough. with the houses forming part of the jetty "road" if you delete house 2 or 3 you break the road. Maybe an F-Variant in a white, or white trimmed building to match @Necora new little water wheel & dock pieces? & transform the fishmonger model into a Fish drying area.